Yann Martel. Photo by Geoff Howe. Used with permission by Random House. To place this introduction into the terms of cultural capital, the speaker is saying he wrote Life of Pi at a time when he had little economic or social capital because his second book was not a success with readers. Although the preface blurs the line between fact and fiction, the implied “second book” is Martel’s 1996 title Self . Martel’s speaker narrates the process whereby the book attempts to gain value though book reviews and author tours. Martel implies that Self did not get good reviews, and that at the time he was not sufficiently important to draw attention to his own work. 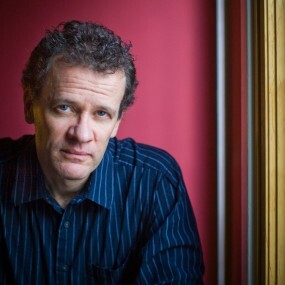 Martel received a Canada Council grant to write Self , and while the book was shortlisted for the Chapters/ Books in Canada First Novel Award, it did not sell. Martel constructs himself as an underdog to build sympathy with the reader. In the preface, the speaker recounts a history of the Life of Pi story. The speaker says he got the idea for Life of Pi during a trip to India from a man named Francis Adirubasamy. After hearing the speaker was a writer, Mr. Adirubasamy “took in [his] line of work with a widening of the eyes and a nodding of the head” and promised to tell “a story that will make you believe in God” (viii). Mr. Adirubasamy presumably tells the speaker the tale of Pi Patel, which makes up Life of Pi ’s narrative proper. Later, when the speaker returns to Toronto he speaks with Pi, who recounts his epic story while the speaker takes notes (x). One of the odder parts of the story is that it addresses, but does not resolve, the issues of legitimacy and appropriation. While the speaker establishes that he found out about the story in India, and that he spoke with the man to whom the events supposedly happened, he never actually establishes that Pi consented to have the story published. In fact, the text implies that the fictive Pi never read the final manuscript. According to the speaker, “[i]t seemed natural that Mr. Patel’s story should be told mostly in the first person, in his voice and through his eyes. But any inaccuracies or mistakes are mine” (x). Thus, the Author’s Note asks the implied reader to consider the ethics of a fictive speaker telling Pi’s story through Pi’s eyes—without showing the fictive Pi Patel the final draft so he could confirm the story’s accuracy. Considering that the text begins by equating the fictive speaker with the struggling Martel, and describes the economic failure of his second book, the reader might wonder about the ethics of making money from another man’s story. There is no suggestion, for example, that the fictive Pi Patel will be given royalties for his story. What is clear is that the speaker will gain economic and cultural capital through representing himself as someone else. While the narrative that Martel’s speaker tells is supposedly fictive, the appropriation of other people’s stories is a very real issue. Ironically, Martel himself ran into this issue with Life of Pi . In the Author’s Note, the speaker thanks a series of purportedly fictional characters, one of whom appears in the final chapter of the novel. He follows this with, “As for the spark of life, I owe it to Mr. Moacyr Scliar.” Unlike the other people he thanks, Moacyr Scliar is not a character in Life of Pi , but a living Brazilian author. Despite Martel’s acknowledgement of his work, Scliar accused him of plagiarism in 2002, after Martel won the Man Booker Prize for Life of Pi . In an essay written for the blog of Powell’s, a large independent bookstore in Portland, Oregon, Martel describes reading a negative book review for a novel by Scliar. Scliar’s novella, Max and the Cats , focuses on a young Jewish man, Max, who must flee Berlin when he is denounced to the Nazis. The ship he boards bound for Brazil has zoo animals in the hold, and when it sinks, he finds himself alone on a lifeboat with a jaguar. Martel writes that he didn’t read Max and the Cats , but the conceit of Scliar’s story influenced Life of Pi : “I didn’t really want to read the book. Why put up with the gall? Why put up with a brilliant premise ruined by a lesser writer. Worse, what if [the reviewer] had been wrong? What if not only the premise but also its rendition were perfect?” (“How I Wrote Life of Pi ” n. pag.). Although Martel acknowledged Scliar in the Author’s Note, the Brazilian author objected to Martel’s use of the idea without direct consultation: “‘In a certain way I feel flattered that another writer considered my idea to be so good, but on the other hand, he used that idea without consulting me or even informing me. An idea is intellectual property’” (qtd. in Rother n. pag.). Martel himself disputed the accusation, saying, “‘I saw a premise that I liked and I told my own story with it’ … ‘I don’t feel I’ve done something dishonest’” (qtd. in Blackstock n. pag.). Although Scliar initially considered legal action, he ultimately decided not to pursue the matter. The real-life questions of appropriation in regards to Life of Pi are an interesting echo of the fictional questions raised from the Author’s Note. Interestingly, recent editions of Scliar’s Max and the Cats evokes the look and feel of the Life of Pi covers. In this way, Scliar’s text gains value from its similarity to Martel’s text while, at the same time, reminding potential readers about the similarities between their plots. Bourdieu, Pierre. Distinction: A Social Critique of the Judgement of Taste . Trans. Richard Nice. London: Routledge, 2010. Print. Scliar, Moacyr. Max and the Cats: A Novel . New York: Ballantine, 1990. Print.